Meet the ultimate combination of image quality and portability, speed and versatility, creativity and connectivity: Nikon 1 J5. 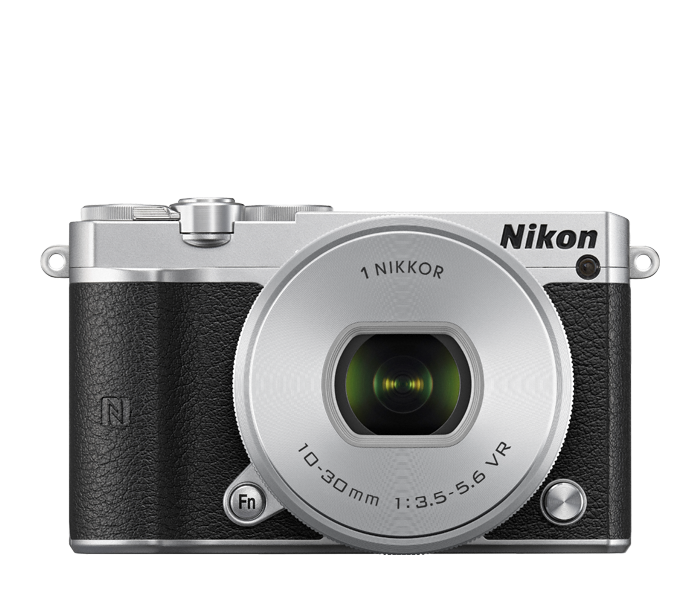 Masterfully designed on the inside and out, Nikon 1 J5 is faster than any DSLR on the market**, achieves image quality and low-light performance few compact cameras can rival and yet is small enough to take on every outing. Shoot 20.8-megapixel photos, 1080/60p videos, time-lapse and slow-motion sequences, HDR (High Dynamic Range) images and much more. Pair it with any superb 1 NIKKOR lens, or add the optional FT-1 Mount Adapter† and use legendary NIKKOR DSLR lenses. With a 180° tilting touch screen, full manual control for those who want it, new onboard effects and even built-in Wi-Fi® and Near Field Communication*** (NFC) for sharing your photos while on-the-go, Nikon 1 J5 is the intersection of advanced technology, image quality and portability. **World’s fastest continuous shooting frame rate (approx. 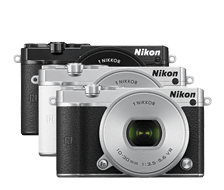 20fps with AF) among digital cameras with interchangeable lenses available as of March 31, 2015; based on Nikon Corp. research. The Nikon 1 J5 achieves a level of speed and accuracy not even a DSLR can match. Its cutting-edge autofocus system uses 105 phase-detect AF points to instantly identify and focus on your subject. Hold down the shutter button and turn each second of action into 20 tack-sharp, full-resolution photos. Fix your focus, and the Nikon 1 J5 can capture at a mind boggling 60 frames per second continuously. * A new Sports Mode optimizes the Nikon 1 J5 for fast-action, so you can switch from shooting pre-game portraits to on-field close-ups without missing a play. *While photographs are being recorded to the memory card, the memory card access lamp will light. Depending on shooting conditions and memory card write speed, recording may continue for some time after shooting ends. Capture in 20.8-megapixels of dazzling resolution. The Nikon 1 J5's all new back-side illuminated (BSI) CX-format CMOS image sensor gathers more light than a traditional CMOS sensor, enabling faster shutter speeds and enhanced low-light capabilities. Nikon's new EXPEED 5A image processing assures rich colors, smooth tones and razor-sharp details in every photo and Full HD video. And when the light is very low, shoot all the way up to ISO 12,800 with no fear of noise—High ISO Noise Reduction stacks four separate images for clean, sharp low-light results. The Nikon 1 J5 handles like a dream. Its 180° tilting touch screen lets you shoot from any angle that intrigues you and puts key controls—even the ability to fire the shutter—at your fingertips. You can quickly select an exposure mode, including full Manual control, from the dedicated PSAM dial, while the Command Dial makes it easy to navigate the Nikon 1 J5's intuitive menu system. You can even customize the Function button to recall your favorite menu or setting. Bring your creative vision to life. Quickly and easily send photos wirelessly from the Nikon 1 J5 to a compatible smartphone or tablet± using built-in Wi-Fi and NFC. Once connected, using the Wireless Mobile Utility app., you can use your compatible smartphone or tablet to share your Nikon 1 J5 photos while on the go and even control the Nikon 1 J5—see what the camera sees and take pictures! For over 85 years, NIKKOR has been the mark of optical excellence with over 90-million lenses sold worldwide. The Nikon 1 J5 connects you to that legacy with 11 superior 1 NIKKOR lens options, from wide-angle primes to telephoto zooms. Add the optional FT-1 Mount Adapter and use the Nikon 1 J5 with NIKKOR DSLR lenses, ideal for anyone who already owns a Nikon DSLR or simply wants to expand their capabilities with these marvels of optical precision.